Praising God for the wonderful work He is doing! 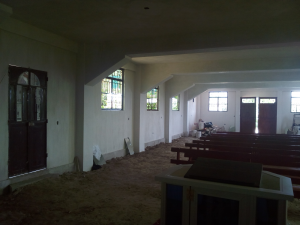 Pastor Antonio sent me the photos of the church. My heart is to fulfill God’s call on my life in Guatemala, specifically with building up Fountain of Grace Church, by mentoring Pastor Antonio, teaching the women and raising up teams for leadership-Plus get the church building project completed, and specially the sanctuary as soon as possible. We are moving forward in the Spirit of Unity. Bridges of Grace sowed money for the windows right before my departure to the States for hip surgery. And these photos tell the story. We are on target! Give God the Glory! My plan was to get the windows in while in the States recuperating! They did it! I am so pleased with their progress. It motivates me to press in more and more to complete my therapy and return to these precious people and the powerful work God is doing! The second part of my plan is to be able to raise more funds for the floor while I am in the States. I am asking for help. Please keep Fountain of Grace Church lifted up in pray as we continue to move forward. And please pray that I will continually be strengthened that I will be well and able to speak up in churches and into the hearts of others to join Pastor Antonio and Bridges of Grace Ministries build up the Kingdom Of God in Xecam, Cantel, Guatemala. Fountain of Grace Church is a worthy cause and a great field to sow good seed and reap an abundant harvest, bringing all Glory to God. If we aren’t laboring with Jesus, we labor in vain. He is Savior, Lord, and King of the harvest!